I had the good fortune of having to travel to Istanbul with work. I took all the things a grown woman needs: suit, laptop, business cards, mom. Yes, my mom met me in Istanbul and in between work meetings, we hit the streets with a map and plenty of sight seeing and shopping stamina. We headed straight for the world famous Grand Bazaar, established in 1461 and one of the largest covered markets in the world. Walking its winding corridors is an amazing assault of the senses: the smells of spices and apple tea, the sounds, the music, the selling chants, the beautiful fabrics, the brightly coloured tiles and lamps, you really can - and will - get lost and explore for hours. We bought plenty of delicious Turkish delight and apple tea. We also decided we wanted pretty throws/bedspreads. My mom bought a beautiful raw coloured bedspread - it took her about 30 mins. I decided I wanted a brightly coloured bedspread, spotted one interesting looking shop and decided that would be the one. You see, there is a whole routine to buying a throw or a rug. You are invited into a little crowded market shop/stall covered with fabrics everywhere. You then sit down and are offered apple tea. As you sip your tea, your seller chats with you about what you are looking for and starts unfurling the fabrics. The more fabrics you see, the harder it is to walk away without buying anything, so choose your shop carefully! I was looking at suzanis - the most gorgeous bright silk embroideries from Uzbekistan. They are handmade by women as a way of showing off their handiwork when they get married. They are beautiful and full of symbols. As I made up my mind as to which suzani I wanted, the seller flirted away (as Turkish men do), offered us more apple tea, telling us suzani history and chatting about Istanbul. I must have seen about 20 suzanis (my mom rolling her eyes about my indecision). An enjoyable hour and a half later (and an exasperated mother), we emerged with two pillowcases and a suzani full sized bedspread (and the vendor's phone number - who kindly offered himself as an Istanbul guide...) for about $160. I bargained for ages - essential behaviour at the grand bazaar - starting from the standard offer of half the price. Triumphant we walked into the sun filled streets of Istanbul. 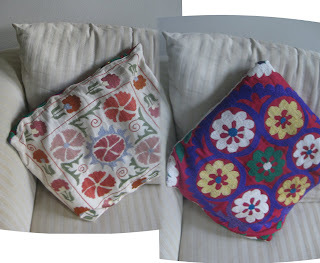 My suzani is bright pink with large circles symbolizing his and her families. Notice how at the center of the large circles you have a flower with two different colours (representing a man and a woman) and then the flowers blossoming and radiating out of it - representing the growing family. Also the square rim bordering the suzani is in two colours - white and a dark green - representing the good times - and the bad times - that marriages go through. Little circles in the middle of the suzani represent the couple's children. I just love it! Istanbul is a fascinating city, an exotic blend of Europe and Asia, with great shopping and bargaining as well as numerous culturally interesting sights, such as the stunningly beautuful Blue Mosque. Check out thrift Mondays at Apron thrift girl.